We went to the top, this morning, celebrating two Vietnam “gods” by visiting where they tread and gave life to this country: political leader Ho Chin Minh and philosopher Confucius. Ho Chin Minh, called a nationalist, a socialist by temperament, a Marxist out of expedience, was groomed in the Soviet Union, was leader of the Viet Minh resistance movement and believer in the same freedoms called for in our constitution (life, liberty and pursuit of happiness). He, only he, brought freedom to Vietnam after centuries of being picked on and violated by China, France and US forces. There was rarely a time in Vietnam history when citizens could sit back and enjoy this peaceful beautiful country. Someone always wanted to conquer it. 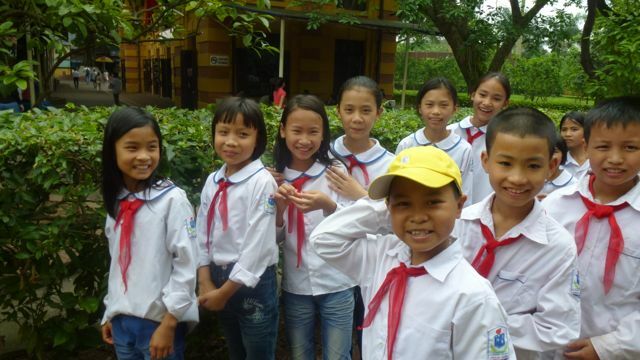 In 1994 President Bill Clinton lifted the embargo, and Vietnam became a tourist mecca. It’s worth the trip. 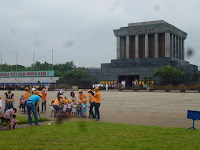 One has to rise early to join the mile line of pilgrims: children of all ages, some tourist and tribute paying Vietnamese visiting the gargantuan Ho Chi Minh Mausoleum in Ba Dinh Square, where many a saber was rattled during the days of conflict. The monstrosity of the structure is supposed to resemble a marble lotus blossom (I can’t see it) built with materials from the famed Marble Mountain in Danang. 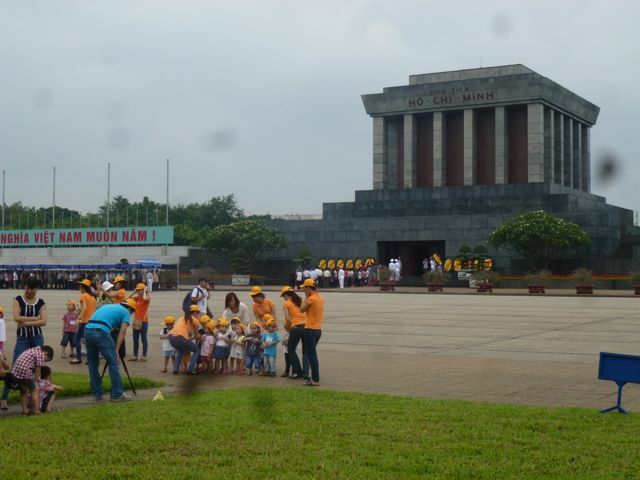 It is skirted by a massive square on one side, where many a soldier high stepped, and the yellow French Colonial style buildings where the bachelor Ho Chin Minh lived and worked. Not willing to live a fancy life, he humbled himself by living in the wooden servants quarters, a small house on stilts which still stands with its green shutters under an amazing forest of giant trees. It was a cloudy morning on my visit and there is a surely a mile long blue walkway canopy all along the route so no one has to suffer the heat. Took about a half hour to get from beginning to the entrance. Guards in white uniforms trimmed in red and gold are surely chosen for their patient nature and smile in order to deal with thousands of children, from babies to teens in organized school groups. Most stayed in a well-disciplined line, while teachers carried the weary and tried to hold on to the wanderers. I laughed because it’s the same all over the world. Kids will be kids no matter where they are. Groups wore the same color shirts or hats (orange, blue, lime green ) or uniforms so their frantic teachers could keep up with them. I was amazed at their behavior and as the little ones moved forward, (the younger ones got in quickly) they held onto the child in front by the shirt tail or the hem of a skirt and one 5 year old kept grabbing the collar of whomever was in front of him. 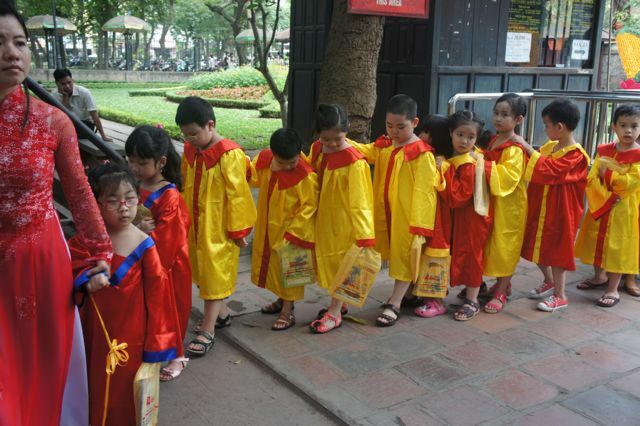 It was such a delight to be among the real Vietnamese and this entertainment made the continually moving long line less tedious. When the children saw us, they all waved their hand and said “Hello.” So we made a lots of new friends with a smile and a “Hello” back. When we reached the entrance to the mausoleum, teachers frantically removed all caps and bonnets to show respect to their leader, Uncle Ho, who is surely smiling at all the young ones’ antics in their tribute. The preserved body of Ho Chi Minh lies in a refrigerated room, much as does Lenin in Russia and Mao Tse Tung in China. It is a somber lighted view that seems as if he is taking a nap. His wispy beard is in tact. His gray uniform memorable. The experience very brief as no one can dawdle. I was watching the little ones watching him but moving on as quickly as possible. 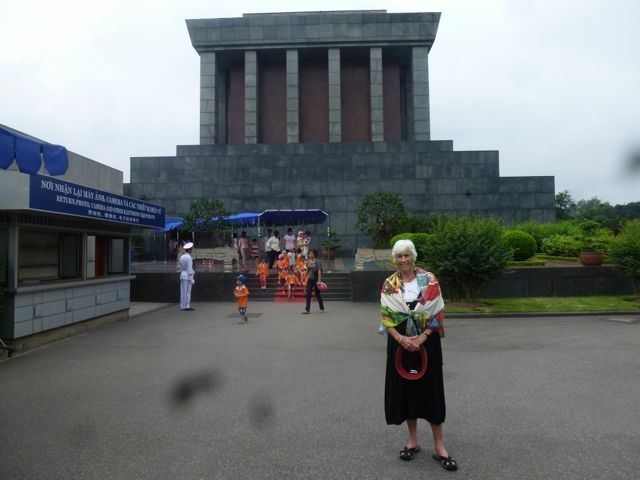 The mausoleum is only open three hours in the morning and not always. Confucius said, among many things, “Set your heart upon the way, support yourself by virtue, lean on goodness, seek attraction in the arts.” The man of wisdom had a lot to say and teach and yesterday I visited Van Mieu, The Temple of Literature, Vietnam’s oldest university, built in 1070 and founded by Emperor Ly Thanh Tong. 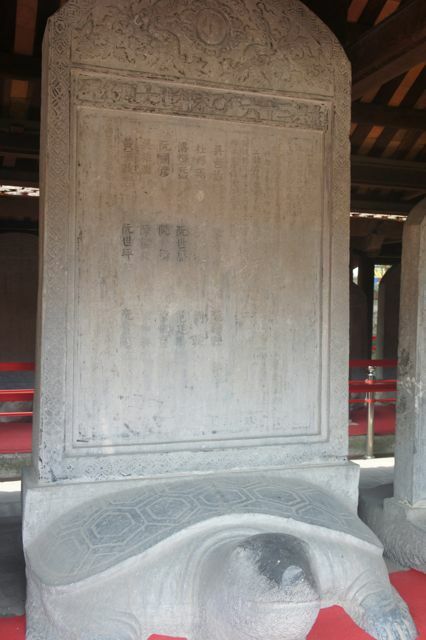 It took hard work and drive to get to be a mandarin, and the 1,306 doctor laureates who made it have their names engraved on 82 stone stelae riding on the backs of Galapagos style turtles. This temple is also an elaborate red and gold tribute to Confucius, modeled after a similar one in Qufu, China. 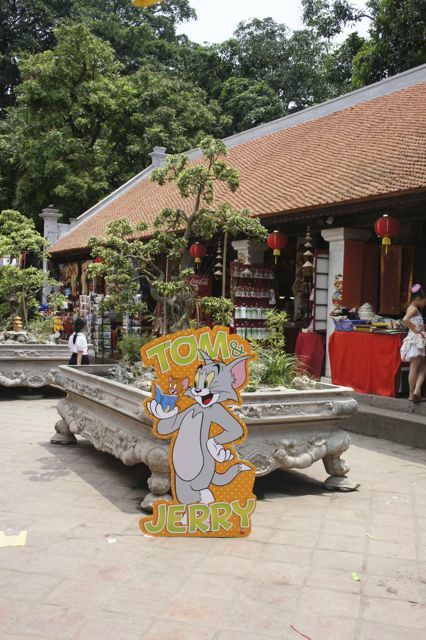 There are many courtyards, lots of Bonsai, plantings to show the virtues one needs in life, Cut outs of Tom and Jerry placed near ancient coluns and hundreds of school children, many wearing yellow or red silk robes and strange hats which signify they were in the process of graduating. We happened to be there on a special education recognition day. 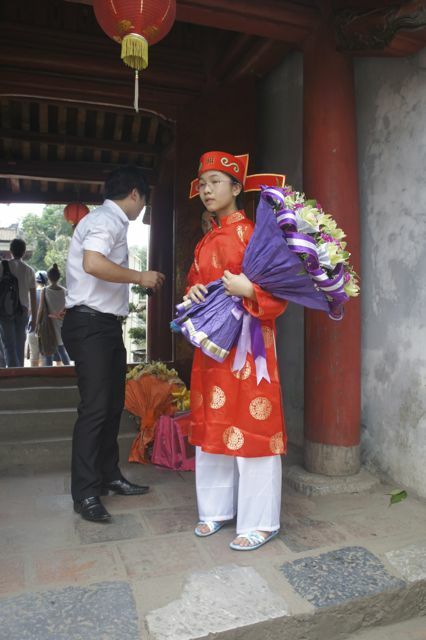 Teachers and parents carried giant bouquets of flowers which they presented to honor their accomplished children. 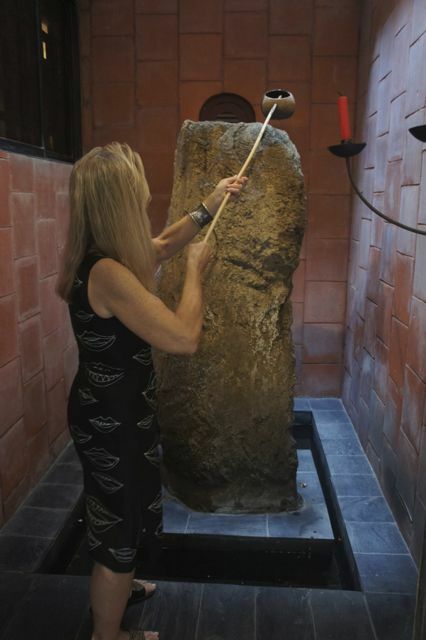 Lecht, an American, who has carried the banner for contemporary Vietnamese artists near and far. She served us lunch prepared by the best chef in the city. The “cat fish” in delectable tiny squash flower vines was an adventure, as were dill fish cakes. Suzanne’s various storied home, part of which was a wooden one on stilts she brought in from the country and had incorporated to the structure she built from scratch, is filled with art by the Vietnamese Five members and many women artists. We walked the Buddha steps: birth, Middle Age, Sickness, Death, Rebirth It can be done either direction. Suzanne's home was a sweet respite in the middle of a crowded, bustling city where mass tourist products dominate. 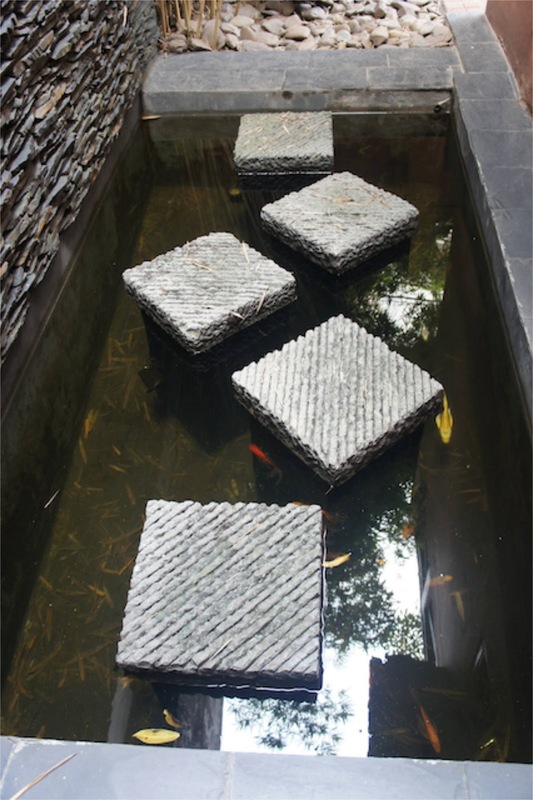 A valid art world, though small, does exist here and is getting world-wide attention. We left here and went to the History Museum to walk through room after room of antiquities. Your "Pilgrimage with Kids" was another amazing day. 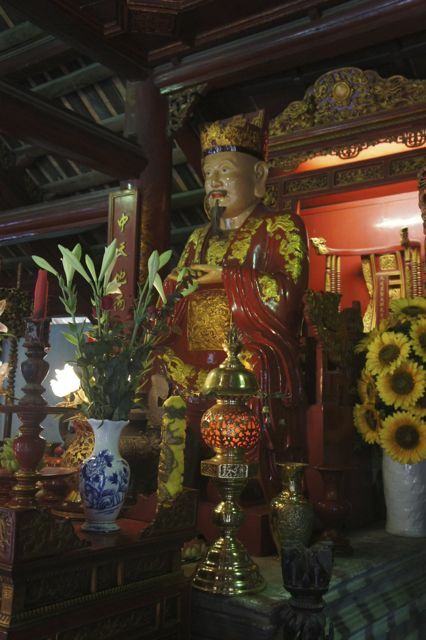 No doubt your visits to Ho Chi Minh's mausoleum and Yan Mieu, The Temple of Literature, dedicated to Confucius were extremely interesting and possibly sobering experiences. Sounds like the highlight of your day was having lunch with Suzanne Lecht. Since you are a day ahead of us, it is probably time for you to be in Myanmar. We're looking forward to your next blog. Hope you got our e-mail late last night about the Grizzlies beating the Clippers 94 to 82. They play game four tomorrow afternoon at 3:30 in the Grind House. Hope they can even the series.